This week I didn’t sit at my sewing machine very much. I find that after a finish, whether it’s a complete quilt, or a top, I tend to need a break. It’s not that I don’t have plenty on my list that I want to do – like finish the last few seams on DWR – but that it ends up becoming a chore and quilting is supposed to be fun. So once I finished the Autumn Splendor top on Monday, I read a couple of Lynn Kurland’s books. Sometime this week I pulled out my music fabrics and started thinking about the back of the Music Star quilt top. Naturally the back is going to music as well. After all I conservatively STILL have 40 yards of music fabric. 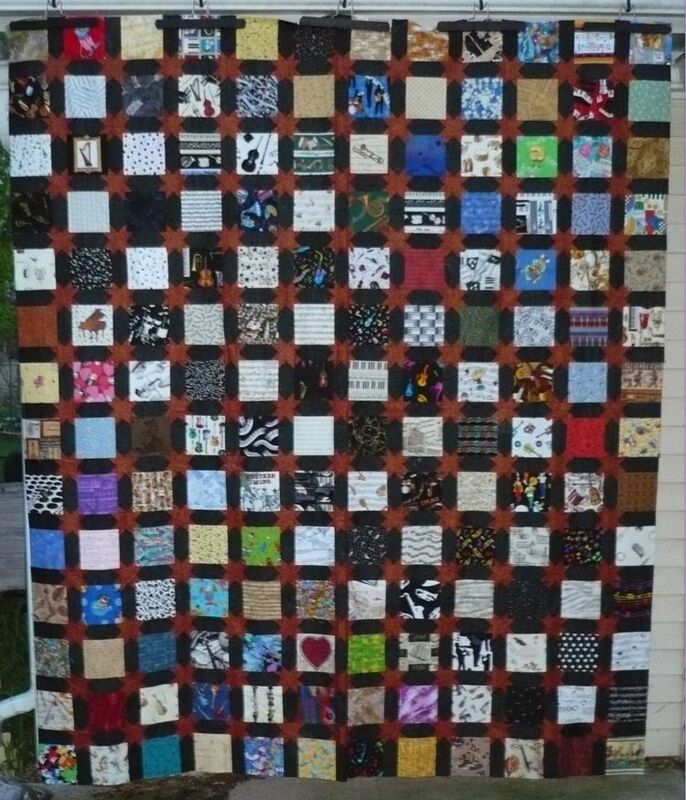 I based my calculation on the 156 unique fabrics in the quilt top — I had to buy at least a FQ and frequently bought more. However it’s probably closer to 90 yards since the music fabric is stored in 2 drawers about the size of my fabric boxes and they are stuffed. My fabric boxes can hold 45 yards of fabric. Of course since I made the top, I’ve bought or was given a few more FQs and I didn’t use every fabric I had in the top. Anyway, I’m making the back ala’ Bonnie Hunter (scroll to the bottom of the page). So Friday after dinner with the girls, I started cutting 10 1/2″ squares, one from each piece of music fabric. I’ve got a few pieces which won’t work as 10 1/2″ squares such as this border print called Marching Band (It’s Pattern # 2923 from Andover Fabrics and was designed by Gail Kessler). This panel is another pieces that didn’t fit. I’m adding a couple of fabrics not already used in the back to it to make it finish at 20 x 30. When it’s all said and done, I’ll need the equivalent of 99 10 1/2″ squares. I managed to get 91 cut Friday and Saturday. So if you’ve made it this far, here is my stash report for the week. P.S. That Snowflake FQ is for the Guild Christmas Party tomorrow. It’s the first thing I’ve bought in 5 weeks. I just love music fabric. Especially black and white music fabric. I don't know what I like about it other than I just like it. Way to go on not buying fabric! Music fabric is fun! The strutting musicians are darling.